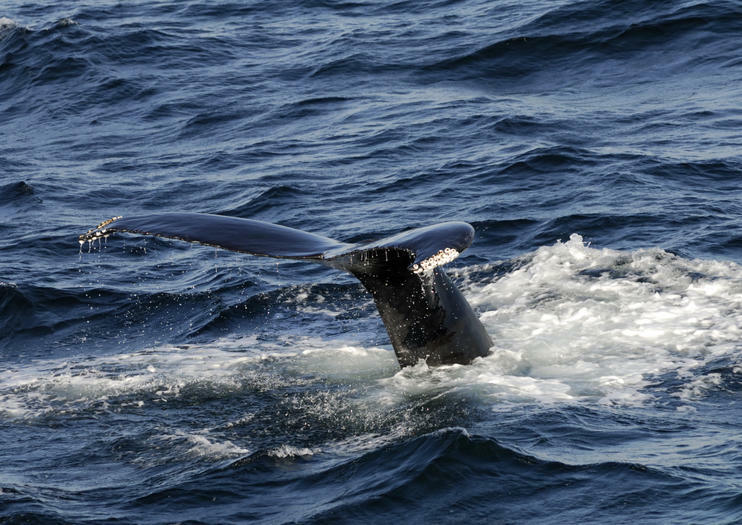 Located between Cape Cod and Cape Ann, the 842-square-mile Stellwagen Bank National Marine Sanctuary is Boston’s premier whale watching spot, as summertime brings hungry migratory humpback whales to the area. Stellwagen Bank is an underwater plateau rich in nutrients, which feed the local ecosystem. The plateau was created by glacially deposited sand and gravel from the Laurentide Ice Sheet. There are well over 100 species of animals that call the Stellwagen area home, whether it’s migratory or full-time. Fish like Atlantic cod, blue fin tuna and striped bass are found in the region. Reptiles, primarily the leatherback sea turtle, and scores of marine birds are also found in Stellwagen. Perhaps the most feared resident in the region is the shark. The great white shark, along with a number of other shark varieties, has been documented in Stellwagen Bank. The mammals frequenting Stellwagen Bank are the most famous, including five different types of seals and numerous whales. The seal varieties are harp seal, harbor seal, hooded seal, gray seal and ringed seal. The real stars of the show at Stellwagen Bank are the various whale species that pass through. Whale watchers are most likely to spot humpback whales, Minke whales, fin whales, and the critically endangered North Atlantic Right Whales, while beluga, orca, pilot and sperm whales are among the others found here. One of the best ways to see the whales in Stellwagen is to take a whale watching tour. These tours include naturalist guides who know the history of the region and are recognized experts on whales. You can also explore Stellwagen by scuba diving expeditions and/or fishing charters. There are also several dive sites, including the Josephine Marie shipwreck. Opplev det beste av New Englands marine dyreliv på denne Super Saver combo-turen. Nyt et 3-timers hvalsøys cruise rundt Stellwagen Bank National Marine Sanctuary. Se pukkel- og finhvaler, samt atlantiske hvitholde delfiner og havnebærer ved hjelp av en naturforsker. Deretter oppdager mer enn 800 marine dyr under ett tak på New England Aquarium. Fra sel og sjøløver til havskildpadder og stingrays, er det en av de fremste turistattraksjonene i Boston. Cruise til Stellwagen Bank Marine Sanctuary på en hvalsafari cruise fra Plymouth med et team av naturalist guider. En blanding av klimastyrte hytter og friluftsdekk betyr et komfortabelt cruise i alle vær som du søker etter Cape Cod Bay's pukkelback, finback, minke og pilothvaler, så vel som de sjeldne truede hvalhvalene som iblant kan være synet på kysten.